For two-year-old PRO Real Estate Investment Trust (PROREIT), this month’s acquisition of seven commercial properties for a total of $40.5 million was nice, but what really puffed up the chests of the outfit’s management group was the fact the acquisitions were funded by a bought deal. “We have been to the market since we started PROREIT three times and this is our first bought transaction with a short-form prospectus,” said Jim Beckerleg, president and CEO of the Montreal-based REIT (PRV.UN-X). The REIT also granted the underwriters an over-allotment option to purchase up to an additional 1,143,750 units on the same terms and conditions for a 30-day period. The offering proceeds will partially fund the acquisitions, fund the redevelopment of an existing property, pay debt and provide for general corporate and working capital. The offering is expected around June 9. “This is a very important transaction for us, not only because it was a bought deal but because it lifts our asset base closer to $200 million and I think that increasing the size and breadth of your shareholder base is good for unit-holders over the long term,” said Beckerleg. (The asset base is currently valued at about $185 million). PROREIT, which has been comfortable buying and operating East Coast real estate, continued that trend with its latest deal making: acquiring four New Brunswick retail properties (totalling 89,000 square feet) and a 28,950-square-foot office property. The REIT also purchased two larger industrial properties in Etobicoke (209 Carrier Drive – 196,877 sq. ft. and 1870 Albion Road – 101,277 sq. ft.), representing its first foray into the GTA market. “We have two strong industrial buildings in Etobicoke, well-leased, and we are pleased with that initial exposure,” said Beckerleg. The two GTA properties are 100 per cent leased with terms of 8.4 years for Carrier Dr. and 2.2 years for Albion Rd. The REIT’s president said observers should not expect the GTA deals to dramatically change the geographic balance of the portfolio in the future when it comes to upcoming acquisitions. “I think our growth strategy is the same as we have been saying for the last year and a half. We see ourselves as we grow becoming a pan-Canadian, diversified commercial REIT but we have a historical focus on the Maritimes and Quebec from a history of deal-making in those provinces. The seven new acquisitions, the product of a number of deals, are characterized by solid tenants under generally long-term leases: government and national tenants make up 85.8% of the acquisitions’ base rent with a weighted average remaining term lease of 7.7 years. Post-deal, PROREIT’s property portfolio will be comprised of 29 income-producing commercial properties representing 1,431,296 sq. ft. of GLA. The company aims to take a diversified approach to its assets, currently holding about 40% in retail, 22% industrial and about 15% commercial mixed-use. Beckerleg likes the “opportunistic” nature that comes with running a diversified REIT – namely the ability to buy property types at favourable times in their valuation cycle – in addition to the stability that diversification gives it. PROREIT has some development work on its books for some of the properties in its current portfolio, but it also intends to make further acquisitions this year. The REIT likes to target smaller properties in secondary markets that are not currently the focus of larger REITs, he said. 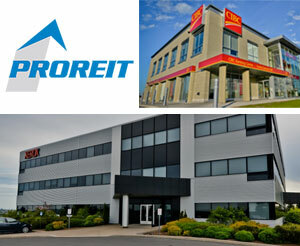 PROREIT’s growth is illustrated in its just-released first-quarter financials: total assets assets doubled in the first quarter compared to the three months ended March 31, 2014 as a result of the $65.6-million acquisition of 14 properties early in the fourth quarter of fiscal 2014. The fourth-quarter acquisitions had a significant positive impact on first-quarter results, compared to the first quarter of fiscal 2014. For the three months ended March 31, 2015, PROREIT recorded property revenue of $3.9 million, a 109% increase compared to $1.9 million in the first quarter of 2014.